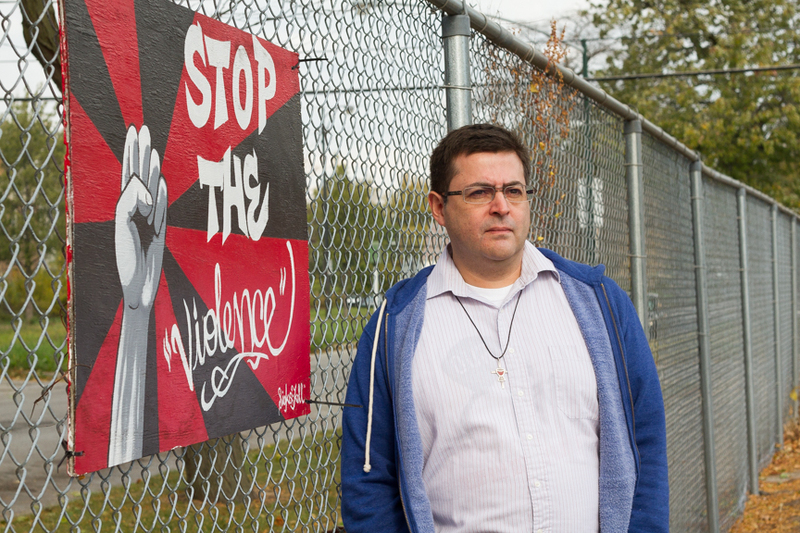 Brother Juan Acuña uses a restorative justice approach with youth grappling with conflict and the aftermath of violence. Even though he grew up under a dictatorship in Chile, Brother Juan Acuña says he had not been exposed to the levels of violence he sees regularly in the Back of the Yards neighborhood. He draws on that understanding in his work today with the Precious Blood Ministry of Reconciliation, which helps people who have been affected by community violence in Back of the Yards. Acuña, two priests and two sisters focus on ways to repair damage caused by gang and gun violence—and ultimately, to prevent youth incarceration. The Chicago Reporter talked to Acuña about the challenges faced by youth in Back of the Yards and his work there. What do you think about the violence occurring in Chicago right now, and what impact is it having on the young people you work with? I’ve never seen anything like this anywhere I’ve been. It really impacts the community. One of our kids was shot in an incident. There is a lot of trauma because of that. A lot of kids know someone who has been shot, someone who has been killed. So that’s always in their minds—feeling unsafe and watching their backs, not trusting anybody. It’s hard for (young people) not to be in a gang here because it’s kind of the way to survive. Lots of them tell me I’m a gang member but I’m not a gang banger, so they make that distinction. For them it’s not safe not being in a gang. We provide a support network. We provide food and clothes, and we also help them go back to school. We may connect them with a school or connect them with a service they may need, such as substance abuse or trauma therapy. Sometimes judges send us youth to resolve a particular conflict. In that case, we sit in a peace circle with that youth—the perpetrator—and the victim in the community and we try to find a way to repair whatever harm was done. One example: A policeman was a victim of a robbery, and after the circle the policeman was able to empathize with the young kid, who didn’t have a father and who came from a bad situation. (The officer) didn’t want any money to recover what was stolen. But he did end up taking the kid out to play basketball. In a way he adopted him and became his mentor. So we create those types of connections. What’s your best argument for why government should invest in restorative justice work? Our policymakers are finally seeing this as an alternative [to incarceration]. What we are trying to show them is a different approach to dealing with this issue of violence: investing in the communities, in building relationships, in programs to help these kids with mental issues or substance abuse and creating a network in the community. The jails are overflowing, and (the punitive approach) is not working. What we are trying to do now is partner with different organizations and create what we call restorative justice hubs. There are different groups around the city that do this type of work and we are trying to collect the same type of information. We are sharing the same database so we can give data to policymakers and show that this is working in our neighborhoods. We know that we are helping these kids; otherwise, we would not be here. If we do a good job in collecting data, they can hopefully increase the budget for next year and invest in this alternative, and not in more prisons. What has stood out the most in your work? We have two kids from the neighborhood working for us now. When these kids realize they can do something better with their lives, they start to see college as an alternative, a possibility. The youth growing up in this type of neighborhood, they don’t see hope. The idea of going to school is foreign because they are trying to survive the day. When they start seeing that maybe “I can do something different” or they see that some of these kids have succeeded, many will say that they can do something different as well. Those are the kind of stories that keep me motivated, that tell me we are doing something good here. Even if one kid can get out of these circumstances, I am happy. You also provide artistic outlets for youth to express themselves. Why is that important? Our circles involve more than talking. For some of them, painting is a better way to express themselves. Many like to write poetry, some like to draw, while others do theater or music. We have an art gallery across the street where they paint and they show their art. We collect the drawings that the kids do in detention and we put them in a magazine called Making Choices, which we distribute so they can tell their stories to other people through drawings and portraits. Stacey Rupolo contributed to this story. Daisy is a communications intern for Community Renewal Society. A journey across Halsted, Chicago’s second longest street, showcases the city’s history, cultural diversity and economic stratification.